Be a part of History! 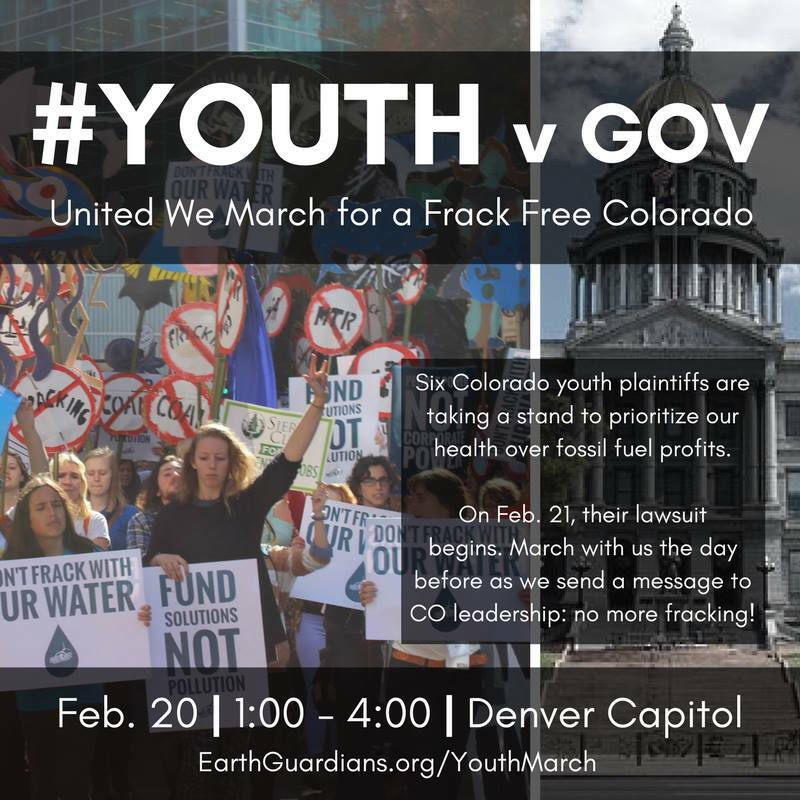 You're Invited to #YouthVGov: March for a Frack Free Colorado. Click the pic above for More Info!! Let's meet on the west steps of the Capitol to march and show solidarity with the six youth who brought the fracking and climate lawsuit against the Colorado Oil and Gas Conservation Commission! We will march, sing, and rally together to show the Colorado Court of Appeals the immense support this case has. The youth argue the Commission has a statutory and constitutional obligation to prioritize protection of public health and the environment over oil and gas development. The young plaintiffs, members of Earth Guardians supported by attorneys with Our Children's Trust, believe this case is critical for stopping dangerous fracking, which threatens water supplies, air quality, the climate system, and consequently public health and safety. On the day following the march, February 21, 2017 at 1:30 pm, lawyers representing the youth plaintiffs, and lawyers for the Commission and fossil fuel industry, will make oral arguments before the Colorado Court of Appeals in Denver.